Make your own delicous english muffins with this set of four english muffin rings. Cooking for a crowd? 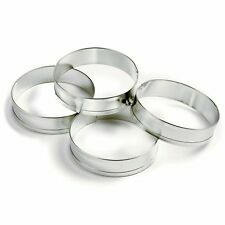 These rings allow you to fry up to four precisely sized eggs or flapjacks at a shot. Or you can boost efficiency by cooking separate items in the same pan without creating an unintentional goulash. The rings' nonstick surface makes for less mess during serving and cleanup, and they're easy to assemble or take apart. Place the egg ring in the pan and crack an egg into it. Tilt the pan to spread the egg so the entire ring is filled. The super fun egg ring is perfect for egg sandwiches on toast or English muffins. Make breakfast a special occasion with these round egg / pancake rings from Norpro. 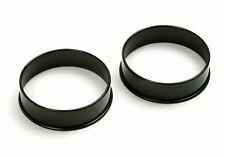 This set of two rings are constructed of metal and feature a nonstick coating, making for easy release and an easy clean up. Each ring measures 3 ½ inches in diameter and 1-inch deep. Included on the back of the product packaging are recipes for Cheesy Egg Delight and Fluffy Buttermilk Pancakes as well as instructions for use. Hand washing is recommended. Made in Taiwan. They are designed to fit over the rim of a pot for cooking. When the egg is ready, the holders stand up for serving. You won’t need to shell out a lot of bucks for an eggcellent creation, made from scratch. The Harold Nonstick Egg Ring includes two rings with handles that sit directly on your griddle or fry pan for perfectly round eggs. The surface is nonstick and a convenient handle helps release the ring from eggs and folds for easy storage. Also works for pancakes! Dishwasher safe. Add interest in breakfast, or any child's meal, by forming pancakes and eggs in these shapes. 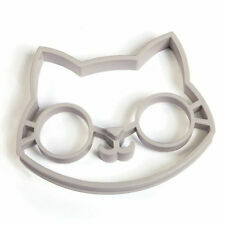 Can also be used to cut out cookies, brownies, breads and much more. Set of 2. Fold down stay cool handles. Nonstick Silicone coating for easy release, easy clean-up and it wont scratch your nonstick pans! Hand washing recommended. Make your own English muffins with these perfect size rings. These English muffin rings are so versatile. 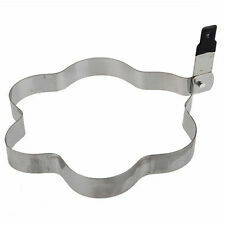 Also use as a perfect pancake cutter, sunny side up egg ring and even a biscuit cutter. Rolled edges. Add a bacon surprise to your pancakes or eggs. Makes 3 rectangular bacon stuffed pancakes or eggs. Everything is better with bacon! Perfectly sized for a half-slice of cooked bacon. BPA Free Everything is better with bacon! Great for making heart shaped eggs or pancakes that the kids will love! Deep enough to add extras like veggies, cheese, cooked ham or bacon. Each ring holds 1/4 cup batter or 1 raw egg. Once the bottom is cooked, remove ring and flip the egg or pancake! Includes recipe card. Cute addition to any breakfast table. Creates round shaped eggs for perfect egg sandwiches. Made from high temp heat resistant silicone up to 536°F/280°C that won't scratch non-stick cookware. Flat bottom of the egg shaper creates a nice seal to help with leakage. Easy to grip handle to remove from the pan. These round stainless steel egg and pancake rings cook the perfect circle shaped eggs and pancakes! Just place them on a seasoned hot griddle or fry pan and pour in the pancake batter or egg. Cook until the pancake batter or egg sets. For perfectly shaped eggs and pancakes use these egg rings. FOLDING 3.75" HANDLE FOR EASY USE and CONVENIENT STORAGE. 3.75" Folding Handle for easy use and convenient storage. UPC: 030734057025. It's made of heat resistant (to 482-degrees F) silicone and also features a handle to easily lift the ring out of your cookware. Cleanup is easy too because the Pancake ring is dishwasher safe. Silicone construction. Includes recipe card. Cute addition to any breakfast table. Box shows minor wear from storage. 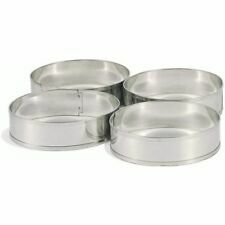 Set of four stainless steel rings are used to fry eggs into a round shape that fit perfectly on an English muffin. The 2-1/4″ tall, flanged handle makes it easy to remove from the frying pan. 3″ diameter. Dishwasher safe. These have a non-stick coating for easy clean up. Handles fold for lift-off and storage. Set of 3 Star Wars shapes of Yoda, Darth Vader and a Stormtrooper. Ideal for turnovers, calzones, dumplings, pocket sandwiches and piroshki. Be creative with your own different fillings. Recipe included. Apparel & Cosplay. Toys & Collectibles. Made of plastic. Create a charming breakfast plating with Mobi's Yellow Flower Egg Rings!With these “fun-tastic” egg molds, breakfast will sure to be more fun! Make breakfast more fun with this whimsical egg mould. Make breakfast more fun with this whimsical egg mold. 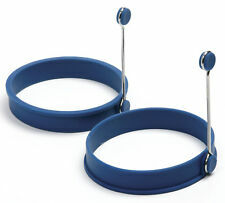 Make perfectly round pancakes or eggs with this set of two rings. The non stick coated rings are 3.5 inches in diameter. Nonstick Silicone Round Egg and Pancake Mold With Removal Handles. Stay cool knock down handles for easy removal from pan. Bend all the way down for easy storage. Silicone is heat resistant to 500°F/260°C. Easy to clean! Williams Sonoma Star Wars Pancake Cookie Mold Set Stormtrooper Yoda Darth Vader. Condition is New. Shipped with USPS Priority Mail. You can use these rolls to make custom size bags as you need them. Save money by buying in bulk and freezing in portions. Make your eggs more interesting with these fun but practical egg shapers from Mastrad. They can also be used as a way of serving rice, mashed potatoes, etc. The shapers are also oven safe to 480 degrees Fahrenheit and can be used for baking cookies and biscuits in the oven. Silicone Egg Poach'r Basket. Prepare perfectly poached eggs in minutes with this convenient Silicone Egg Poach'r Basket featuring a non-stick flexible silicone basket with a handle and feet. Heat resistant up to 675 degrees Fahrenheit. You're always likely to make a scene at the table when you CRACK A SMILE! Each set includes an easy-to-fill silicone mold that works well for either scrambled eggs or pancakes, and a colorful plate that serves as a dramatic background for breakfast fun! Instructions: Grease with butter or nonstick cooking spray. Place on seasoned hot griddle or fry pan, with handles up. For best results use an extra large pan with a flat cooking surface of at least 10.5”. Breakfast Shaper – Snowman. Dishwasher Safe. Condition is New. See photos. Your perfectly poached egg will slide out easily onto the plate. Bags are recyclable, biodegradable and non-stick. Single pouches include 20 poaching bags. Always use fresh eggs. Easy solution for making a perfectly poached egg. Toast bread in the toaster. Due to the build process of 3D printing being built layer by layer, it is normal for slight surface imperfections to occur. Press into slice of bread. I DO NOT accept special requests to alter a model or the cutter (design work). Fun shapers for hard boiled eggs! Turn your eggs into fish or car shapes. Great for little ones or parties. WILLIAMS-SONOMA EASTER PANCAKE NON-STICK MOLDS SET OF 3. Charming molds transform pancakes into edible Easter Greetings. The non-stick molds are easy to use and a snap to clean. RETIRED - NEW IN BOX. Put eggs into the mold and use them from breakfast sandwiches! Williams Sonoma Spooky Halloween Pancake Molds Set Of 3 Ghost, Bat, Cat NEW! New never used but paper wrap broke. See picture. Great for making heart shaped eggs or pancakes that the kids will love!??. Deep enough to add extras like veggies, cheese, cooked ham or bacon. Each ring holds 1/4 cup batter or 1 raw egg. Once the bottom is cooked, remove ring and flip the egg or pancake!